Follow Curley, Aggie, Clem, and Sarah of Monticello, IL in the 1930s as they live their lives and interact with other people in town. At the height of old-time radio, soap operas were one of the most popular genres. Monticello Party Line was one of those soaps that targeted the female listening audience. Sponsored by Dr. Caldwell's Syrup Pepsin, a laxative, the show was about two couples who lived in Monticello, Illinois (also the home of Dr. Caldwell's Syrup Pepsin). The original premise of the show revolved around a telephone party line though the party line was rarely used. 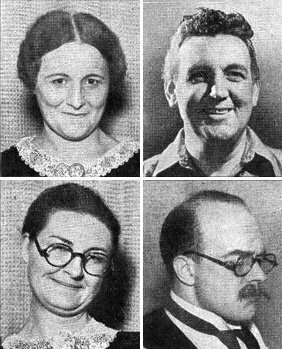 The show revolved around the lives and problems of two couples, Curley and Aggie Peters and Clem and Sarah Tuttle plus the people who moved in and out of town. Shows featured comedy, tragedy, conflict, in short, everything you might expect from a soap opera. On the air for at least four years and likely more, the show offered premiums like recipe booklets by Aggie and Sarah or samples of Dr. Caldwell's Syrup Pepsin. Sometimes the premiums were written into the scripts. This collection also contains two PDF files of the Aggie and Sarah's recipe books. The 15-minute show was written by Sandra Michael who also wrote the soap opera, Against the Storm. While Monticello Party Line was a bit more light-hearted, Against the Storm attacked more serious subjects because Michael believed that women wanted, and needed, more serious topics. Divorce was about as serious a topic that Monticello Party Line tackled. Be the first to comment on "Monticello Party Line"